Probably Animaniacs, since I've seen the entire series (and only 30 or so episodes of Tiny Toons). 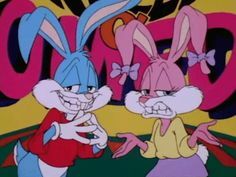 The Warner Brothers, or the Warner Sister? Thanks to Rosie Willowwater for the avatar! Elmira for sure since I relate to the animal obsession. Interesting question, given that both are under the same umbrella of WarnerMedia, which is now owned by AT&T. I know I remember watching Looney Tunes on Cartoon Network when I was young. Batman Beyond was Warner Animation, but aired and was marketed on Cartoon Network frequently. In fact, the umbrella is why DC properties were on both Cartoon Network and Kids WB back in the day, and now Cartoon Network and the CW. But enough technical nerding. In-house CN Cartoon Cartoons vs Warner Animation, gotta go with the Cartoon Cartoons. I just have more personal attachment to, say, your Samurai Jacks and your Courage the Cowardly Dogs than the Looney Tunes or their offshoots, and I generally prefer DC comics and games. Nicktoons or the CN Cartoon Cartoons? I'd say Nickalodeon because some of my favorite cartoons are Invader Zim, Ren and Stimpy, and Rockis modern life. But CN also has a few of my favorites such as Ed Edd n Eddy and Over the garden wall. dplutonium13 Fanfic Writer/Artist "Sentio Ergo Sum"
Kim Possible for sure. ; D Though I here Power Puff Girls by Lauren Faust is good too. My little pony or Adventure time? [big]dplutonium13 Fanfic Writer/Artist [/big] "I am Drunk when I Write, I become Sober when I Edit"
My Little Pony. Adventure Time's art style is off-putting to me, while MLP's is appealing and pleasant to my eyes. I can be very picky about art in my cartoons. Foster's Home For Imaginary Friends or Wander Over Yonder?